Yesterday’s workout with my group was a good one. We completed several giant sets for the upper body. It was a bit long, taking the entire hour. If you don’t have a whole hour or are just getting started, you can reduce the sets from 3 to 2 or cut out one of the circuits. The thing that can be difficult about doing circuit workouts in the gym is taking up too much space and equipment. This workout will let you keep the space and equipment to a minimum while giving you all of the benefit of multiple exercises with no rest. Each giant set is based on the equipment you will use for the exercises. Giant sets are mini circuits. 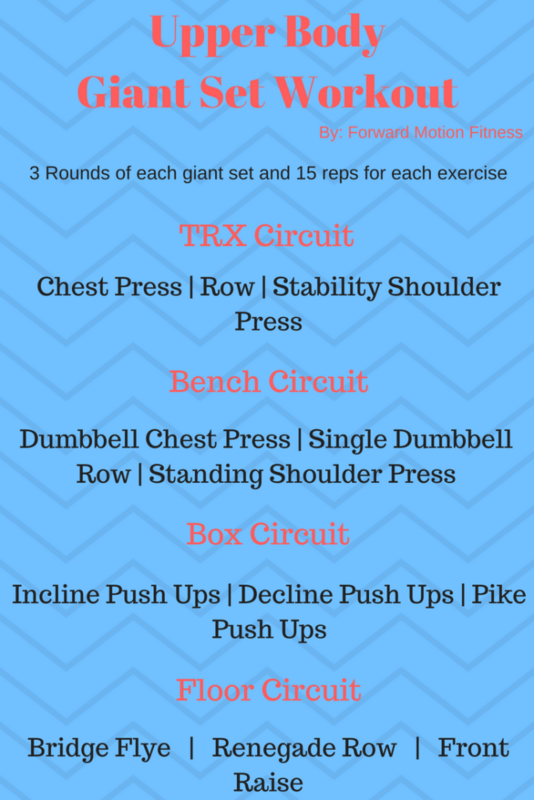 In this workout each circuit or set has 3 exercises. You will repeat each of the 3 exercises in rotation 3 times with a 1 minute rest in between each workout. Each exercise will be performed with 15 repetitions. In each set you will rotate between chest, back, and shoulders for a full upper body workout. You will also see a lot of incorporation of your abs so be mindful of having a strong core through your workout for the best results. TRX is a great way to incorporate your core and all of those stabilizer muscles in your workout. If you don’t have access to a suspension training system you can skip this round and add an extra set to the other circuits or try substituting with a cable system. We start with the chest in each set. You can adjust the difficulty by stepping forward or backwards. The back exercise is the row. Keep your shoulder blades together and keep a straight body for that upright plank position. This exercise is easier than it looks. It is a great end to your set by engaging those muscles the entire time you are in position and working your shoulder as you press up. This exercise is great because each arm has to move indepentently. Keep your back flat and squeeze those shoulder blades together. Make sure not to lean back. This is all in your arms and if you can’t stand tall, make the weight just a little lighter. With the popularity of box jumps, you can find a box in almost any gym. But, there are many other uses. This push up trio will use many different muscles so don’t be intimidated by all of the push ups. We know the incline push up to make a regular push up easier, but it is a great way to strengthen the upper part of your chest muscles. If the incline push up works your upper chest, the decline works your lower, right? Right. This one is for your shoulders. Keep your head down to help your body focus on your shoulders. Feet on the floor is a little easier and you can put your feet on the box to make it a little harder. Keep a bit of bend in your elbows and get those hips up. Keep your plank straight and strong in these renegade rows. Stand up tall and focus on your shoulders trying not to let you neck steal the show. That is it! If you need to get your whole upper body in one workout, this will be a good one. If you give this workout a try, let me know how it went in the comments below.